The electrical industry is in a constant state of change as technologies continue to advance. As the industry evolves, so do the tools that contractors use to manage their businesses. These tools have not only simplified operations, they’ve also increased their efficiencies. In addition to voltmeters, screwdrivers and wires, modern day electrical companies have added cloud-based software to their toolkits to help employees work smarter and improve customer satisfaction. When you compare the old way of doing business to the practices that today’s top-grossing contractors employ using field management software, it’s simple to see how they outpace the competition. Past: Electricians kept track of customers by recording their contact information on a Rolodex card. The cards often had important details scrawled onto them. Or, an electrician had to retrieve a client’s file to find this and other information. Present: Modern day electrical companies use software programs to organize customer information and simultaneously view important details; no more searching through outdated notes or address books. Past: Workers recorded their hours on time cards by hand. Administrators had to double- or triple-check that the hours reported were added correctly. 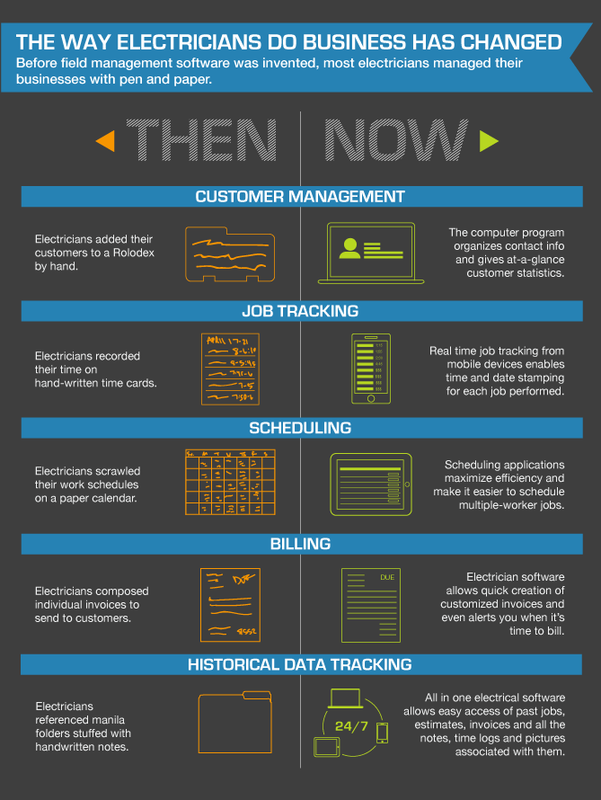 Present: Electricians use field management software to track their exact hours using mobile devices. The software has time- and date-stamping for each job, so workers record the exact amount of time they worked without rounding up or making mistakes. This function greatly simplifies payroll, prevents inconsistent time tracking, and allows managers to discover time management-related inefficiencies. Past: Contractors used white boards or paper calendars to manage jobs and work schedules by hand. Present: Electrical software makes it simpler to track projects and schedule multi-worker jobs. It also prevents double booking an employee, forgotten appointments, and accidentally booking a worker on his or her day off. Past: Electricians took several hours calculating the cost of materials, labor and other aspects of a project to create a quote. Present: Modern electricians use field management software to create accurate project quotes in minutes. The software has the cost of various materials saved in the program, automatically calculates the labor at different pay rates, and includes permit fees and other essential items to prevent underbidding. The ease of use allows contractors to create more bids and win more jobs. Past: Electricians created individual invoices by hand. Present: Software for electricians creates custom invoices in a few simple steps and sends you an alert when it’s time to bill a customer. You may send the invoice instantly via email. The system also sends an alert when a bill is past-due. Past: Electricians had to retrieve client information from a manila folder kept in a file cabinet, meaning that they also had to wait to get back to the office to update client files. The folders often contained several handwritten notes and documents that were simple to misplace and misinterpret. Present: Today’s electrical contractors use all-in-one electrical software that keeps notes about projects and clients, photos, estimates, invoices, time logs, communications and other important details in one location. Workers can access the latest information instantly from an internet-connected device. They may also update files in the field, while the information is fresh in their minds. Past: Electricians had to return to the office to access customer information on a desktop computer. 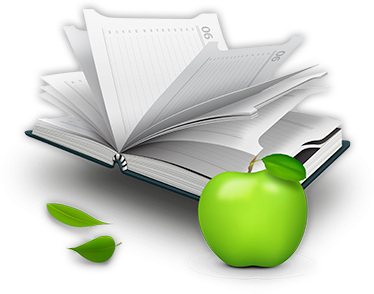 Professionals used a variety of programs to manage client files, perform bookkeeping, create quotes and invoices, as well as other tasks. A company used software designed for the masses that had features that workers would never use. Furthermore, if a computer crashed, a contractor likely lost the data saved if there weren’t backup files on an external drive. Present: Electricians access cloud-based software from almost any device that connects to the internet. Because the data is stored in a secure cloud, a contractor never has to worry about data losses resulting from computer crashes. Our developers designed 360e’s software to an electrician’s exact needs, so a contractor never pays for unnecessary features. The platform is simple to use and integrates with existing programs, allowing a user to perform multiple functions using one program. Learn more about how to take advantage of the efficiencies that cloud-based software for electricians awards by scheduling a free demonstration of 360e today!